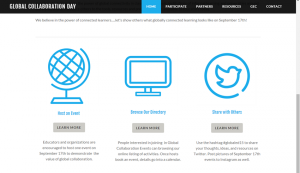 Join 1,000’s of educators for the very first ‘Global Collaboration Day’ – September 17, 2015. The 2015 Global Education Conference will be held November 16-November 19. All details on the Global Education Conference website. Applications now open for presentations. The entire conference is virtual and will take place online in webinar format. Sessions are held around the clock to accommodate participant time zones.